If your cat eats the other cat’s food everybody loses. Why does this happen? For cats, to share territory is something exceptional and means losing control over their resources and that is critical in cat’s life. For example, when two cats live together they usually share the feeding station or the same area where they eat. If one of the cats does not want to socialize with the other, it will be forced to wait till the other is done eating. 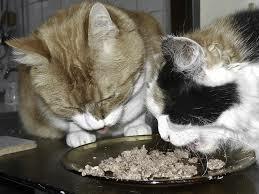 As a result, both cats will have to eat faster than normal or one of them will eat more than the usual intake. Sometimes one cat won’t even get close to the feeding station because it does not feel comfortable and might end up being hungry or the opposite, might start eating excessively to keep the other cat from eating “its” food. This last situation is what this article refers to. When a cat eats the other cat’s food not only eats more than a healthy and recommended intake but also leaves the other cat with no food, causing malnutrition in the cat that does not get to eat. If you have a kitten this problem is even worse as kittens need to eat enough food to get all the nutrition to grow up. Is There Any Solution to Resolve This Problem? Creating a feeding station where only the starving cat can get access to and excluding the cat obsessed with food. You can build a very simple feeding station with wood, cages or even big plastic containers with a lid (the image shows a litter box station, but the concept is the same). 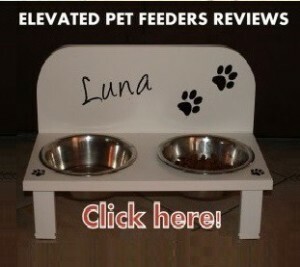 You can also use a big piece of furniture to create your feeding station. 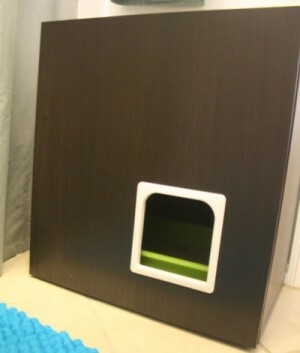 Once you have decided what type of material your box-feeding-station will be, you can install a selective electromagnetic cat door in it, making sure that the cat that does not get to eat it’s the only one with access to the feeding station. 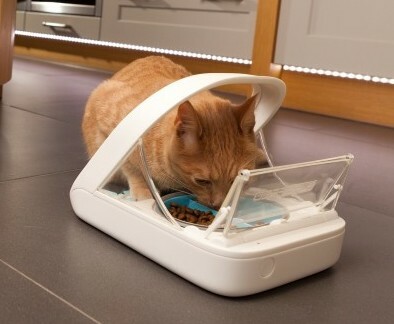 Inside the feeding station you can place whether an automatic cat feeder or simply a regular bowl. To feed your chubby cat you can get an automatic pet feeder with the capacity to dispense small amounts of food at a time, several times a day. 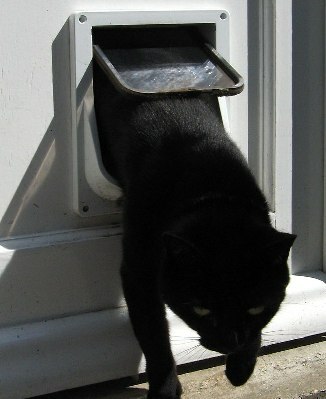 This way you can control your chubby cat’s weight in case you are free feeding him/her now. 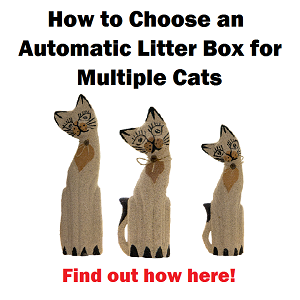 This is an excellent solution to separate cats that need a different diet. A different option is separating your cats in different rooms by installing an automatic pet door in the interior wall, panel or glass, depending on where you want to place the food for the skinny cat. A good option is feeding your slow eater in the garage, installing the pet door in the garage’s door or placing the automatic pet door in the terrace’s glass door or laundry room. The concept of feeding station is the same, but instead of a box, the hungry cat will enjoy a whole room by himself when meal time ;-). You can place an automatic feeder so you don’t need to open the room to place food when meal time. 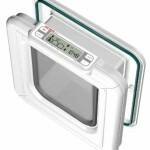 There are several brands and types of cat doors, to choose the most suitable for your room feeding station, check a list of full reviews here. Getting an automatic pet feeder to feed several pets through a selective mechanism, such as RFID tag collar or microchip technology. 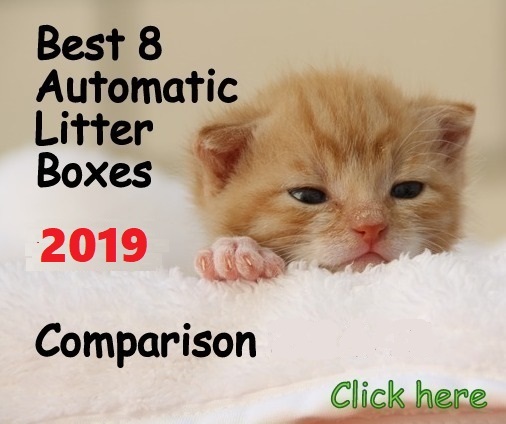 Currently, there are three solutions in the market: Wireless Whiskers, the SureFeed Microchip Pet Feeder and the PortionPRO RX which is the latest innovative automatic feeder in the market. 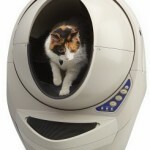 Wireless Whiskers automatic pet feeder has a gravity system and works with RFID collar tag. 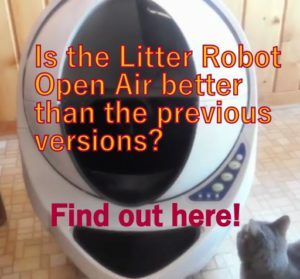 The unit has two small transparent doors that block the food and open when making contact with the cat collar, recognizing and greeting each cat by name. 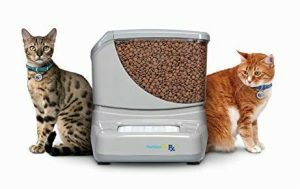 This automatic cat feeder is able to distinguish what cat is eating and also it gets auto programmed automatically, measuring the right and healthy intake for each cat. 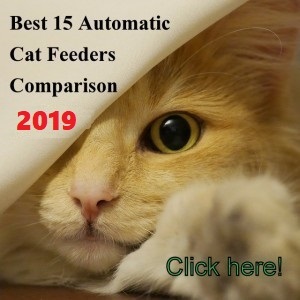 This means this automatic feeder calculates how much each cat is eating in a period of 1-3 days and if one of them is eating too much or too little, it gives that cat the right amount of food. 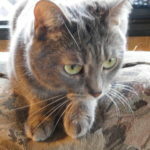 Once the feeder is auto-programmed to give each cat the allowed amount of food, it won’t let the chubby cat to eat more than a healthy daily intake because when the cat reaches the recommended food intake, the doors will shut. On the other hand, if a skinny cat does not get to eat too much, the feeder will open in contact with this cat’s collar until it reaches the healthy food intake. 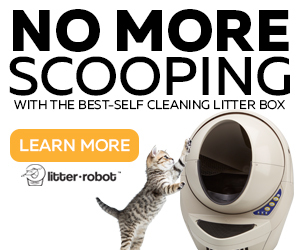 SureFeed Microchip pet feeder works with Radio Frequency Identification technology, RFID. The authorized cat with an implanted microchip opens the feeder’s lid that keeps shut at all times protecting the food from the chubby eater. To trigger the mechanism the cat needs to locate its head underneath the hood to get the microchip read and open the lid so he or she can eat. If the cat is not microchipped a RFID collar tag works as an alternative. 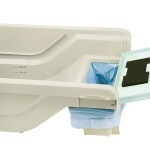 The PortionPRO RX works with RFID technology. This feeder allows you to feed your cat RX diet and it’s excellent to protect the food if your feline is being food bullied. 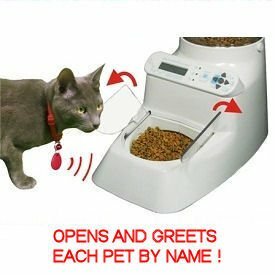 This is a good automatic feeder because it gives you the alternative to set it up in open mode in which case the assigned cat doesn’t need to use a collar tag, but the pet you want to keep away from the food has to wear it. This is good because some cats simply won’t wear a collar. The PortionPRO RX’s motorized sliding food door protects the food shutting when the unassigned pet is within 3-feet distance. This unit is the only selective automatic feeder that is not a gravity feeder (like the Wireless Whiskers) and is not a free-feeding system (like the SureFeed). The PortionPRO RX is programmable to feed your feline up to 6 meals p/day with the daily amount of food you choose. Also, its unique and efficient sliding motorized door doesn’t let the unassigned pet to even get close to the food. The PortionPRO RX works only with dry food. There are also good toys to make cats play and at the same time re-educating their eating behavior because they have to work to get their food and slow down when eating. Your cats will be healthier and happier by applying any of these solutions. 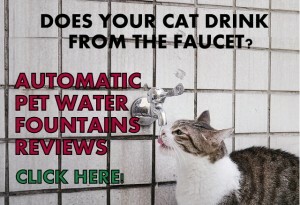 No more cats overeating or starving! How about when one cat us a feral who us used to hiding and not coming out, the other one is constantly hungry, whining, eating the other’s, or jumping on top of drive to pick dirty pan or dishes? hello Carlida, in this article you can find good solutions to separate cats when it’s time to eat.